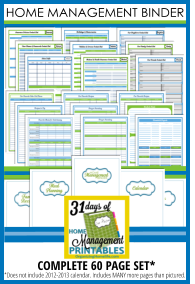 Welcome to Day 29 of our series on building your Home Management Binder. This week we are building the Meal Planning section of our binders. If you prefer, as I do, to keep a separate binder for meal planning, recipes, etc., you may want to get a new binder and print out a cover for it here in the Binder Printables Cover Page post. One thing I love to do is cook. I have a lot of recipe books, magazine tear-outs, and recipe cards from friends and family. And, ever since Pinterest came along, well, you know. There are a zillion recipes I want to make! 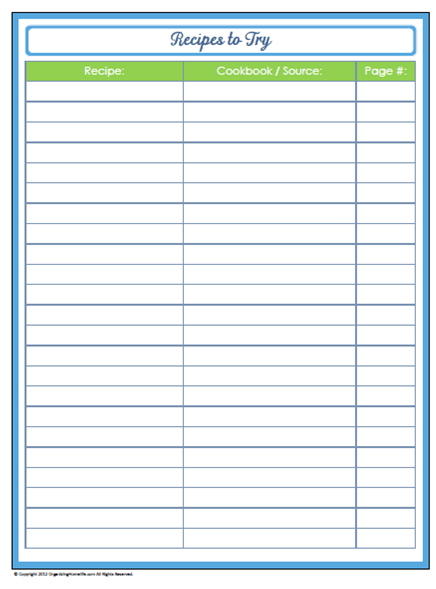 Today’s printable is a spot to write down recipes that you want to try. Simply jot down the recipe name and source for an easy reference when making your meal plan. Just want you to know how much I am enjoying “31 Days”. I’ve tried using planners and schedulers before, with varying success. Now, at retirement, I assumed I could live without anything like THAT running my days. OK, it’s not the first time I’ve been wrong! I’m grateful to you for posting these. I’m finding new ideas for things I can put on paper and quit trying to remember, and also seeing better ways to track things I’ve kept in a planner before. I’m on my way to better organization and I thank you!